It was early on a Sunday morning when he awoke to make the coffee. The scene and smell were all too familiar as he entered the front room. Quietly, he stepped over men asleep all over the floor. In the kitchen he poured himself a cup and sat at the table. As the coffee smell filled the house he heard the first wake-up groan. As he started to sip his coffee, several men joined him at the table after filling their own cups. They were free and expected to help themselves as if blood kin. Just the night before they had all gathered at this small ranch for a roping. The event was not finished until the early morning hours so many accepted the invitation to sleep on the floor. The cowboys began to wake and moved outside behind the barn. Someone grabbed a bar of soap and the outside faucet became the wash place for all the guests. The host always kept Sunday with his family consistent with his Christian belief of worshiping God on the appointed day. Then he thought, “Where do these men go to church?” It hit him like a kick from a cow. These men were not going to church, so he would bring church to them. This is one of many true stories of the start of a Cowboy Church. Red River Cowboy Church began in a converted Mexican beer joint called The Tejano Rose. After some Bible waving, promise claiming, and loud praying we started the rebuild. The task, although more than any of us expected, could not and would not be shirked. Work has always been a part of the cowboy way. Soon the purchase of cattle set the arena ministry in motion as team roping filled Sunday afternoons while children played on sand piles. Usually with little or no previous church experience to get past, those who attend cowboy church feel free to jump right in and help wherever they can. Reverend Novice Northington, pastor of the Red River Cowboy Church in Denison. Most of the music is up-beat but there is some slower singing done to a three-beat waltz. Like a calf looking at a new gate cowboys, see a pipe organ or think of a Doxology the same. I am convinced that the devil himself invented neckties thinking if he couldn’t silence preachers, he would just choke us to death slowly. Don’t get me wrong. This is America h, and any cowboy would fight at the drop of a hat for freedom to worship God as he sees fit. So, if neckties and pipe organs “fry your bacon,” then go have breakfast. Perhaps the best way to explain the popularity of Cowboy Church is to explain cowboys a little. 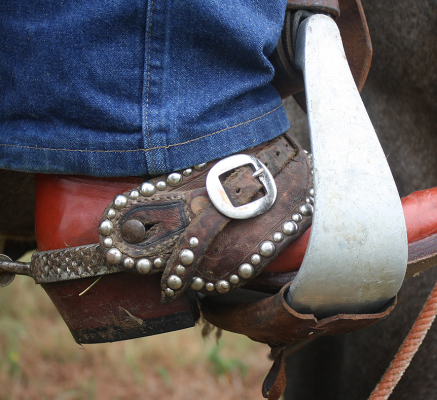 Being cowboy is not just about what you wear as much as why you wear it. It is not as much about how you look as it is about how it makes you feel. Every piece of clothing and gear has a purpose. Stepping up into the stirrup and swinging your leg over, you now sit where everyone wants to sit. You ride into the box and set your horse for the run. Your partner’s ready, you call for the cow with a nod. 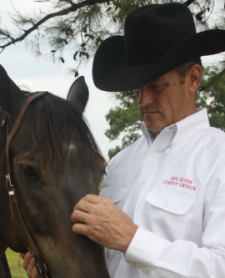 From a dead stop your horse feels your release and explodes out of the box with the kind of power that throws you back in the saddle, (and sometimes out of it). Almost without thinking you swing and then throw your loop. You catch both horns clean and jerk your slack. Thumb pointed up, because you want to keep it, you make a quick dally, wrapping twice. The rope comes tight, and you cue your mount with your right spur to pull the load. The cow set, you pull him off left as your partner makes the corner and rides in fast. Bottom strand down, top strand up, and spoke all the way through, your heeler breaks his loop across the steer’s hind legs. He jerks slack, makes the same wrap and comes to an instant halt as you turn your horse to face-up.. All in six or seven seconds. If just reading it makes something tingle on the inside, you may be more cowboy than you thought. So, cowboy up. My husband and I have traveled to may places and visited many churches. Novice Northington, pastor of the Red River Cowboy Church in Denison is by far my favorite. I am so thankful to Pastor Novice for being there for me when I was going through a tough time. He is an amazing pastor and has a wonderful church. Looking forward to visiting your Church, just found it on google. Seems like a place I need to visit. High-quality tools in the garden are an essential investment. You buy them new just once, then enjoy them as they become even more valuable with age. A typical Big Box Store-bought implement may not last nearly as long. And certainly brings no cachet to the tool shed.